A young inventor and his wife die in a car bombing - leaving behind a will that surprises friends and parents by directing a vast fortune toward charities in the developing world. On the ground in Afghanistan, international charities rapidly search for Afghan partners to compete for the attention of the new foundation - including an orphanage and a health team supporting reproductive rights. As part of their strategy to win the new funds the two groups try to focus attention on two particular women in the village of Laashekoh: a young mother imprisoned for murdering the village leader's oldest son and a woman who has a reputation for providing reproductive health care, including abortions. When they discover that the first woman abandoned her infant daughter, and the second has no actual patients, aid workers and lawyers scramble to enhance the stories. Meanwhile, most Laashekoh villagers do not want Western charity and are astounded to be regarded as potential recipients. Then a group of orphanage workers visiting the village goes missing, and foul play is immediately suspected. The stakes are high, the sums of money are huge, and cultures clash. All these are motivations for fraud and murder in Allure of Deceit. 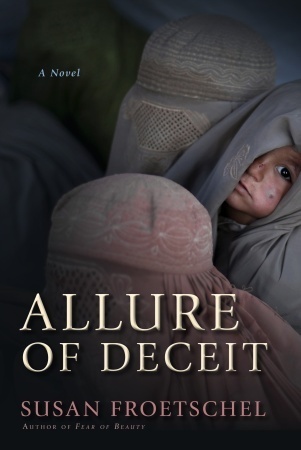 Allure of Deceit was named best novel for adult readers by the National Federation of Press Women in 2016. It's the sequel to Froetschel's critically acclaimed Fear of Beauty - winner of the Youth Literature Award from the Middle East Outreach Council; a 2014 gold-star winner for best suspense, Military Writers Society of America; and a 2014 finalist for the Mary Higgins Clark Award, MWA.